THERE ARE UNMISTAKABLE signs that running a half marathon in February is perhaps not the brightest decision. Take, for instance, the handwritten sign held up for runners just past the start of Sunday’s Hypothermic Half Marathon: Running is mental and you are all insane. My brain, numb in the way it gets after slurping a slushy too quickly, is not retaining information in the –18C cold. As quickly as I read the words, they are whisked away like the wisps of breath escaping the fabric buff stretched across my mouth. Perhaps I am crazy but I am hardly alone. Registration for the annual Hypo Half is capped at 400 participants. The spots sell out quickly once they are posted in late fall. All of the 16 Hypos that the Running Room hosts across Canada — plus one in Minnesota — are popular. For some runners, the lure of the Hypo is the fact that it keeps them training past the glory days of fall. "It’s a motivator for them," says Bruce Bowen, manager of the Running Room on Spring Garden Road. "You have to train through the winter." For others, though, it’s more of a bucket-list item. "It’s for somebody who likes a challenge," says Bowen. "They can compete in, or complete, a moderately challenging distance in the middle of winter." Although runners jump when registration opens in October, invariably by late January some look to sell their spot. Injury, change of plans or lack of training makes them change their minds and Bowen tries to match sellers with buyers. In the spirit of full disclosure, I must confess that I, too, tried to sell my $60 entry. Insufficient training made me do it. And in another unmistakable sign of the foolhardiness of it all, I didn’t get any takers. The course winds its way from Shearwater to the turn-around point on Dyke Road, following a route that is deceptively flat. But the signs are there that the worst is yet to come when volunteers at the turn-around mark pass out Kleenex, hand warmers and cups of water complete with ice crystals. A hill at 13 kilometres comes out of seemingly nowhere to mock runners who have gone out too fast. Just beyond that, when the route flattens out and runners dare to hope for the end, a headwind picks up with an icy fury that steals breath and freezes limbs. The wind cuts through clothing and ravages bare flesh. I reach down and touch my legs to check that my running tights have not mysteriously fallen off. It feels like my skin is exposed. I hear Mexican music in the distance and wonder briefly if I have finally succumbed to the cold. But it’s just the final water stop manned by members of Dartmouth’s Heart and Sole Running Club who sport sombreros with their snow suits. The volunteers who marshal the course and man the water stations stand around for hours in the cold so that the runners can get the glory. "It was freezing," volunteer Lisa Tramble says after the run, her cheeks still red and glowing. "My toes and fingers are freezing but we had the music going, we were dancing, we were jumping around. We started at 7:30 a.m. but we had so much fun. We actually made that fun." So much fun in fact, they already have plans for 2013. "Next year our water stop is going to be over the top," gushes Tramble. "Wait and see!" As popular as the Hypo is, even over the top water stops might not be enough of an incentive for some runners to return. "I did it because it was my 10-year running anniversary," says Amy Tully-Knockwood of Truro. "It was cold and windy. But it wasn’t terrible. That’s winter in Nova Scotia." Tully-Knockwood ran across the finish line hand-in-hand with her daughter, Gabrielle, 6, who joined her for the final sprint. She loved the Sea King Club facility at 12 Wing Shearwater that was used for pre- and post-race and was pleased with her 2:26 finishing time. Still, it might not be enough to get her to do it again. "I’m some glad it’s over," Tully-Knockwood says with a laugh. "Once might be enough! We’ll see." Next year, as always, there will be those who choose to return, using the Hypo as a motivator to keep running in the winter or as a way to challenge themselves. They likely saw the sign hoisted by a volunteer at the last water stop: Pride is forever. Pain is temporary. Of course, there will be those who, despite their early intentions to run, decide to sell their spot at the last minute. They likely saw the other, slightly hidden, sign: You’re on your way to hell. Keep going. Heart and Sole, formed in February, emblematic of Blue Nose’s ‘people’s marathon’ motto From elite runners to newcomers, group focuses on fitness, friendships. Members of Heart and Sole Running Club jog past the Sullivan's Pond fountain on Wednesday evening. When Johnny MacPherson helped found Dartmouth’s Heart and Sole running club a few months ago, staying fit suddenly became interesting. MacPherson picked up running about a year ago in the hopes of getting healthier. Since having his two children, four-year-old Rowan and two-year-old Carrington, MacPherson — a former rugby player and triathlon competitor — had fallen into a sedentary lifestyle. A diabetes diagnosis was further impetus to change his ways. “You get into your profession, you’re at a desk most of the day, and then kids come along,” says MacPherson, an urban planner who works for the city. When MacPherson, Michelle Kempton and several other friends formed Heart and Sole in February, he became confident the lifestyle change would be permanent. The group, which is free to join and has grown to 230 members, puts runners into comfortable training groups and provides weekly, pre-planned routes of varying distances. “The club is really the glue that holds my training together and has now become a pretty good social networking opportunity,” says MacPherson, whose wife Deidre is also a Heart and Sole member. MacPherson, who is running the half-marathon on Sunday, says he expects 60 of Heart and Sole’s members to participate in the Blue Nose, including many first-timers. 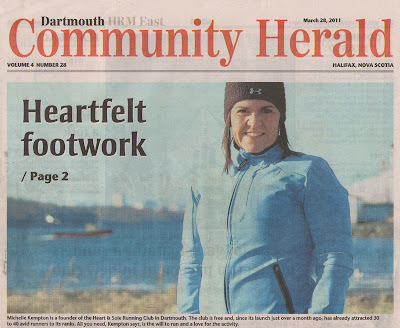 Michelle Kempton is a founder of the Heart & Sole Running Club in Dartmouth. The club is free and, since its launch just over a month ago, has already attracted between 30 and 40 avid runners to its ranks. All you need, Kempton says, is the will to run and a love for the activity. Social joggers, marathon runners put feet to pavement in new club. 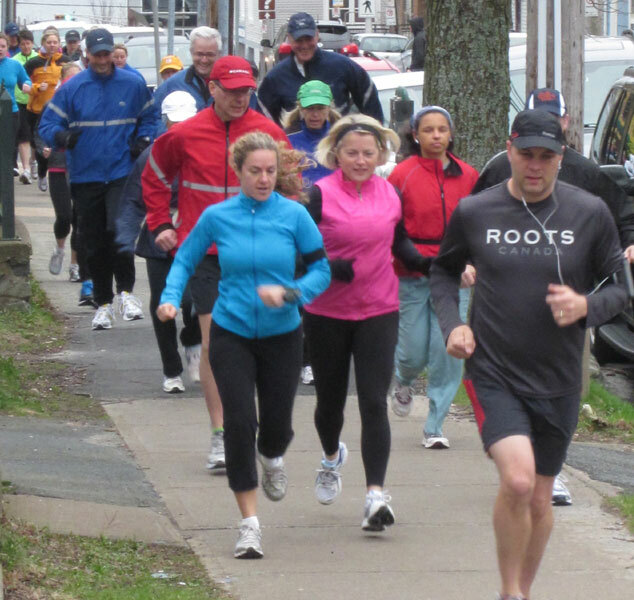 Whether you want to just get out for some fresh air and socialize for a five-kilometre run, or are training for a 20-kilometre marathon, there’s a spot for you at the new Heart & Sole Running Club in Dartmouth. "We have everybody covered, we have everybody from . . . weekend warriors, who are doing it just to stay fit, and then we have people who compete in races," Michelle Kempton, one of the social running club founders, said in an interview. "We have a lot of people now training for the Blue Nose (Marathon) that are running with us, different distances. And it’s just a good way to find other people to run with." Joining the club is free. 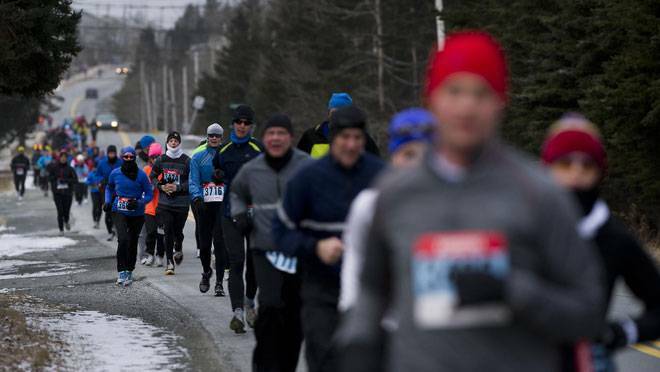 And you don’t have to live in Dartmouth to run with Heart & Sole, but "you do need to be brave enough to tackle our hills," the club website says. Kempton, of Cow Bay, has struggled with weight issues all her life. When she began running two years ago, she tipped the scales at 250 pounds. But with a lot of hard work, she lost 120 pounds, 85 of which she attributes directly to running. "It just changes your life and it’s all possible but you do have to take small steps." Kempton and five other friends, who had been running together, started the club in mid-February. "And we told a few friends and by word of mouth, it’s just taken off," Kempton said. Still in its infancy, the club already has 30 to 40 runners showing up each week. To date, most of them are from Dartmouth. "It’s a support system for each other and because there’s such a mix of people, if you need help or you want to find a running partner, this is an opportunity to do it," Kempton said of the all-weather club. "It’s a lot easier on cold winter days or rainy spring days to go out and run when you know that there’s friends out there that are going to be with you." At 9 a.m. each Sunday, they do a nice run around Dartmouth and at 6 p.m. on Wednesdays, they either do hill training or speed training at a track and run short distances. 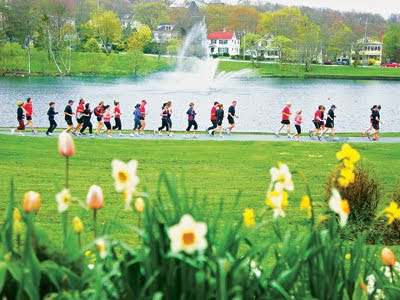 For the hill training, the runners meet at the Sullivans Pond gazebo and run up and down Portland Street. The whole goal of the hill training is to become stronger runners by repeatedly running up and down a hill. "There’s a power in doing it as a group; it feels good, there’s momentum that you don’t necessarily get when you’re by yourself," Kempton said. Though they meet and run as a group, each runner is responsible for his/her own safety, training and achieving personal running goals. "If you have a passion for running, this is the club for you," Kempton said. "It doesn’t matter if you win races or if you’re just doing it on the weekends to run, everybody is welcome." Dartmouth’s Heart & Sole Running Club and the Halifax Trail Runners (two of the largest free running clubs in metro), organized a Trails to Streets Exchange Program for their members this weekend and it was a huge success! The goal was to give members from each running club an opportunity to meet new people and experience something different! On Saturday, Halifax Trail Runners gave their visitors a 5K guided tour of their favorite trail system near Long Lake in Halifax. They were skillfully guided through the most picturesque woods within the city limits. It was a wet week in metro, which made for soggy conditions in the woods, but a group of 17 runners happily zig zagged through the trails, jumping over roots and rocks, under branches and into the mud. The runners stopped on rock peaks, where they’d take a moment to enjoy the views of the lakes and catch their breath. They managed to cross swampy areas by balancing themselves over hand-made 2x4 bridges and planks that were strategically placed by previous trail enthusiasts. A few runners did get soakers, but that was all in the fun of it and it was unanimous among the group that they enjoyed their off-roading experience. The runners had just enough time to try out their sneakers for Sundays adventure when Heart & Sole Running Club returned the favor by welcoming the trail runners to a 60 minute city run along the beautiful lakes of Dartmouth. Even with the damp mist and strong winds, over 30 runners showed up at Heart & Sole Running Club’s regular Sunday morning meeting spot, Two If By Sea Café. This cheerful group welcomed everyone and showed them how enjoyable it can be to run within the different communities of Dartmouth. Locals probably wondered if there was a race going on, as they witnessed a mass of runners heading up Ochterlony Street together. The group ranged from runners who just started to a couple months ago to those who have run for years. No matter the distance they traveled or the pace they ran, the one thing all of these people have in common is the passion to run. This inclusive running groups encouraged all participants to run at a pace they felt comfortable with and no one was left behind! After the weekend, the runners from both groups enjoyed well deserved coffee and croissants and a bit of socializing too. Many runners found new running partners and all enjoyed the adrenaline rush of a great weekend enjoying fresh air and exercise! Halifax Trail Runners is currently working with Salomon Running on their coast-to-coast launch "Street to Trail Tour", proving to all runners the benefits of both endeavours. The event this weekend in metro was proof that all runners can benefit from a balance of both types of running (especially when they have the right type of footwear)! Both clubs participate in races throughout the year. The trail exposure for the street runners will help them on May 14th, when they attend the Benny Bulldog Trail Race in Shubie Park. This is a 5K charity race organized by Dartmouth running phenomena, Stacy Chesnutt. Runners can expect to enjoy manicured trails, rolling hills and a well organized race. Heart & Sole Running Club has over 40 members registering to race through the trails that day and is encouraging their new friends from the Halifax Trail Runners to enjoy this fabulous event with them too. It's free to become a Heart & Sole Running Club member.